The black cat was out on the ice on the Arkansas River in downtown Wichita on Thursday afternoon, and it wasn’t moving. A motorist spotted the cat shortly after 4 p.m. and, concerned, called 911. An animal control team arrived on the scene and contacted the Wichita Fire Department, which alerted the water rescue team. “When we got there, there’s a cat out in the middle of the river sitting on some ice,” Wichita Fire Lt. Kenneth Ast said. The rescue team donned wetsuits and life jackets and inflated a rescue boat, but waited for an animal rescue group to arrive with a net and pole in case the cat became aggressive as they approached. The rescue team took the inflated boat out on to the ice, tethered with ropes, and drew close enough to pick the cat up. The ice “was starting to crack right when they got to the cat,” McBee said, but neither the cat nor the rescuers fell into the water. 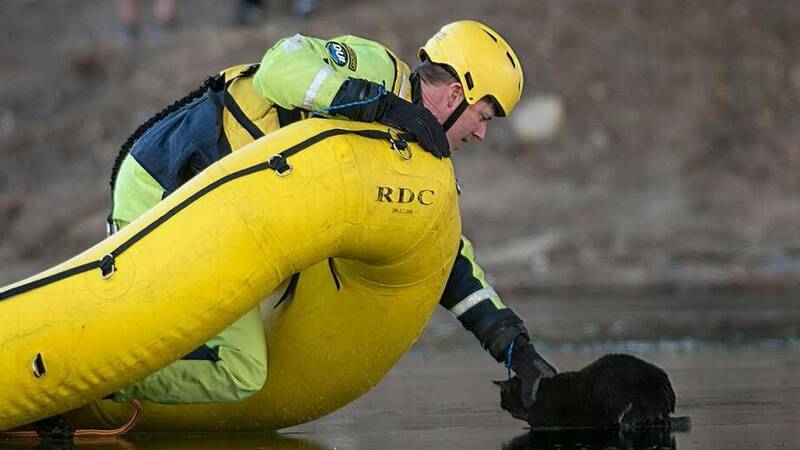 The rescuers were pulled back to shore and the cat was crated for a trip to the emergency veterinarian. How the cat ended up on the ice was still speculation late Thursday, fire officials said. “I know the cat was not in good shape,” McBee said. Beauties and Beasts, an animal rescue group, posted late Thursday night that the cat, whom they dubbed “River,” had a broken right rear leg. X-rays were being done to see if River’s pelvis was broken or damaged and to see if there are other broken bones. “His poor pads were peeling off and nails extremely short on the front and missing some on the rear, maybe from clawing in a panic unable to move,” the group’s Facebook post stated. River was being stabilized with warm fluids and food, along with pain medications.